There are some ideas I intentionally skipped to improve the story. There is no toilet/toilet door since I want it to be a confined space, with only one exit. I also skip the handle in the ceiling that helps you pull up yourself, as well as a walker. I don't want anything that indicates that the hospital want the Old Man out of the bed. To the viewer, they should be planning on keeping him there forever. 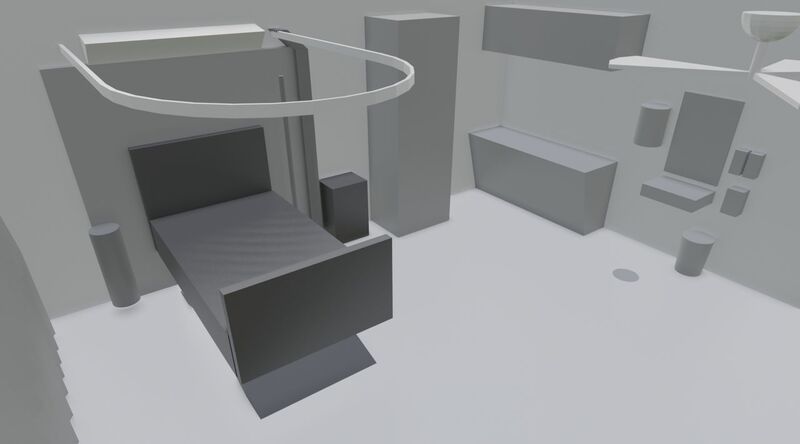 With this list in place, I wanted to start giving everything a placement and size within the room to get an idea of the actual layout, before giving the objects a proper design. For the creation of this room, I decided to do bit of a different workflow compared to what I have done for the other pieces of concept art. Previously I have been doing 2D images, drawn in Krita, with the intention of turning them into 3D models later. Essentially a 2D -> 3D workflow. For his room, I will actually add another step, making it 3D -> 2D -> 3D. By having a 3D-step first, I can easily move around the objects and get a feel for their size and placement, including the room itself. Then based on that, I can create the actual designs by drawing the objects/room in 2D. As I have mentioned earlier, I have decided to work in meters and centimeters for this film. It makes it easier to reference the real world when you can just input real measurements of different objects. I can run around in my apartment and measure things, like how high is a door? Where is the handle? During the placement of all these different objects, I found that a room size of 6x6.3 meters seem to work well, making it fairly squarish. For the ceiling height, I will go a slightly higher than a standard ceiling, at 2.65 meters. This to give room for the piping and some other things making looking up at the ceiling rather unpleasant. Perhaps I will make the ceiling a bit higher later on based on how it looks in camera, as long as the Robot can reach it since he has to be able to place the cotton there. With this 3D scene done, I will render out flat images of these 6 different views, and use them in Krita as reference for drawing. Hopefully I can then create nice looking designs for all these objects, as well as the room in general. 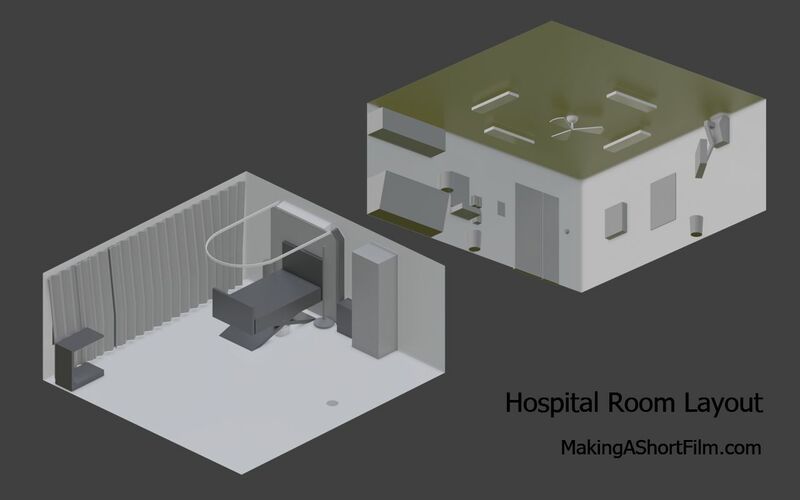 I will also add the rest of the items in the list above that wasn't needed to figure out the layout, like pipes and ventilation. See you when it is done! PS: Instead of just looking at these images, you can easily download the 3D scene here down below and look around for real!